FILE - Cranes are seen in the Azov Sea port of Mariupol, Ukraine, Dec. 2, 2018. Ukraine says Russia has begun allowing some ships to enter Ukrainian ports on the Sea of Azov, in what could be a possible sign of easing tensions in the area. 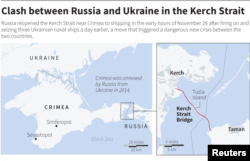 A statement Tuesday attributed to Ukraine Infrastructure Minister Volodymyr Omelyan said the Berdyansk and Mariupol ports have been partially unblocked, adding that ships are coming and going through the Kerch Strait towards Ukrainian ports. The minister said he hoped the ports would be fully unblocked in the coming days. But the United States said Tuesday that “even a partial blockage” is “unacceptable,” both under international law and Russia’s obligation under its agreement with Ukraine regarding the usage of the passageway. The Kerch Strait is the only passage to and from the Black Sea and the inland Sea of Azov, which is jointly controlled by Russia and Ukraine. “We don’t see that as a success,” a senior State Department official told press traveling with Secretary of State Mike Pompeo at the NATO meeting in Brussels. “Generally, from a NATO-wide perspective, no one will see that as a satisfactory move or end of the matter,” the administration official added. The United States is working closely with European allies to raise the costs for Russia following a November 25 incident, in which Russia fired on two Ukrainian naval ships and rammed a third vessel in the Black Sea, seizing the ships, and claiming they illegally entered its territorial waters. The clash has driven tensions between Russia and Ukraine to their highest point since Moscow annexed Crimea in 2014. Ukrainian naval ships seized by Russia are seen docked in Kerch, in Russia-annexed Crimea, in this image from video released by Russia's Federal Security Service, Nov. 27, 2018. Russia and Ukraine have blamed each other, with Moscow closing the strait to all traffic and Ukrainian officials accusing Russia of denying passage to Ukrainian commercial traffic in and out of Mariupol and Berdyansk. Ukraine also put its forces on alert and imposed martial law in its border regions after the military confrontation. A State Department official told reporters Tuesday that the United States is working with allies on possible repercussions for Moscow. “We have complete consistency on our concerns and messaging, right now we’re assessing how to get the crew and ships out; there are a variety of options for that,” said the State Department official without elaborating.